Thanks LOOSELY WOVEN for “DREAMS’ ! 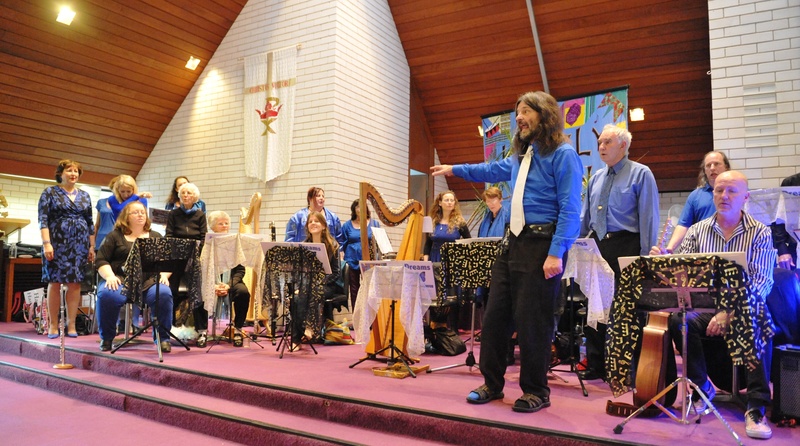 A very enthusiastic audience of nearly 100 applauded the new concert from “ Loosely Woven” which was performed by 26 musicians and singers at Avalon Baptist Peace Church last Sunday (31st Aug.). “DREAMS” was a great hit with the audience who insisted on several encores. ” once again our humble band of minstrels was able to loosely weave for us a vision of something greater – to ‘turn the world around’. ‘Dreams’, proclaimed the banner for Loosely Woven’s latest production so I came to the show expecting some light, ethereal diversion. I should have known better – beneath this group’s musical merriment beats a lion’s heart of down-to-earth social convictions – an awareness of ‘the passion and the power and the hope and the grace … written in the lines of the average face’ as the title song declared. They manage to address deep, universal issues on a personal scale while never failing to entertain. Though missing a few threads due to illness, the ensemble gave a warm and spirited performance, featuring many new pieces while revising old favourites and tackling a hallowed classic in ‘Bridge Over Troubled Water’. I felt the programme was infused with a tinge of melancholy ( apt for these tense times and the ‘dreams’ theme ) that lent pathos to emotive numbers like Sarah McLachlan’s ‘Angel’ and Neil Finn’s ‘Fall At Your Feet’, which enjoyed sensitive readings by Jeannette Lawrence and Greg Thompson respectively. Samantha O’Brien ( flute ) and Noni Dickson ( harp ) came into their own as vocalists and Meredith Williams spoke to and for all of us with Nana Mouskouri’s plaintive ‘Mamma’. The instrumental engine room provided plenty of steam – Bee Higgins ( clarinets ) and Fiona Munro ( violin ) earned kudos here with their sweet, lyrical tones – but the voices drove this train. The choral section just blooms with each outing and David Wilson’s lead tenor rang gospel-true. The fragile, human element is the major strength of this largely amateur troupe, allowing them to spin the dirt of common sorrows into audible gold. ‘Dreams’ thus amounted to much more than reverie : once again our humble band of minstrels was able to loosely weave for us a vision of something greater – to ‘turn the world around’. Avalon Amnesty Group thanks Wayne and the musicians for their dedication to helping Amnesty work for human rights around the world. 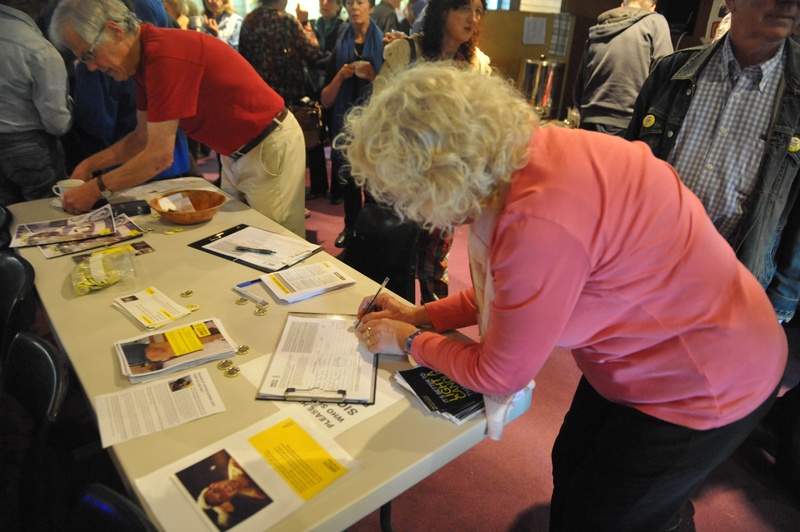 Many petitions were signed in support of a young girl who has been tortured in the Philippines, and generous donations were made to Amnesty. 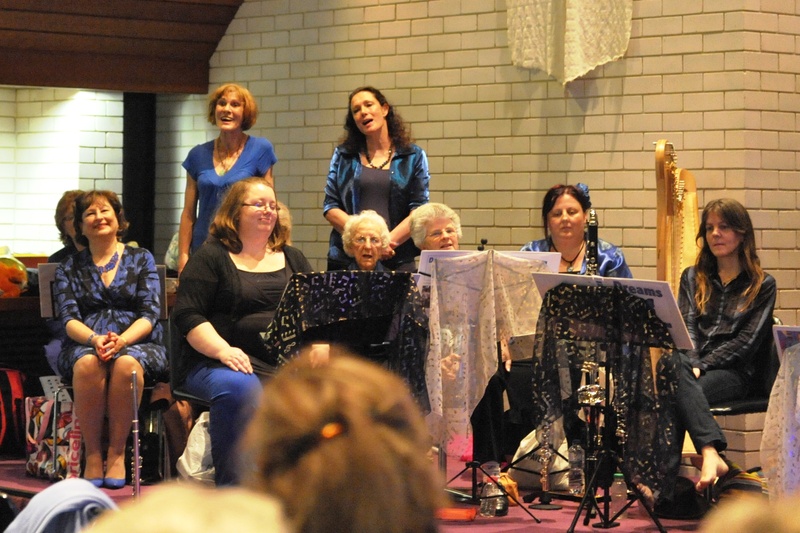 Thanks also Avalon Baptist Peace Church for hosting the concert and providing a delicious free afternoon tea. The Church is so generous in supporting human rights work in the mission of peace and justice .Special thanks to Rev. Mary Hurst for the huge amount of work she does in organising and serving delicious refreshments to the audience, as well as cleaning and organising the space afterwards. Watch for news of our next concert on December 7th. “DREAMS” will be a folky, light-hearted acoustic concert performed by 26 musicians and singers. Instruments include violins, viola, cello, flutes, harps, glockenspiel, guitars, mandolin, concertina, melodeon, keyboard and percussion. Loosely Woven concerts are always lots of fun. refugees and asylum seekers;for indigenous people; for many individuals at risk of unjust treatment; for those at risk of torture and execution;and working to gain human rights for disadvantaged people all over the world. We will have a table with information and petitions for signature at the concert. Date: Sunday 31st Aug. 4p.m.